Google SearchWiki Launches - ORM Concern or Opportunity? 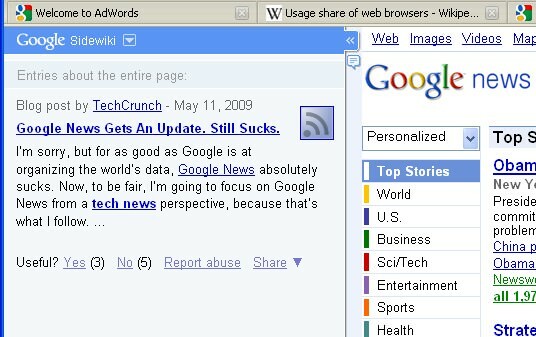 Google Side Wiki is a new Google Toolbar Feature has launched today. This feature looks to be their latest attempt to build communities around web sites in their index , perhaps as a way to better utilize social signals for ranking both web pages and social media profiles. Will Google’s new tool make headway? If past efforts are an indication, they have an uphill battle. But the people making these things at Google are not fools – they are going to hit some home runs – and this type of tool aligns well with trends about social media participation, consumer created content and online reviews/ratings. It’s true that this will probably grow slowly and adoption may not be that huge, it still pays to watch it carefully. I worry a lot about the businesses with static, boring websites, substandard services and a general lack of awareness of the web. Many with expensive websites (but crap services) may find “picket lines” of commenters showing up right next to their fancy home page? It’s going to be more important than ever to turn those people into fans – fans who comment. Sidewiki enables users who have installed Google Toolbar to contribute information alongside any page on the web, inside of a simple sidebar UI. This information, which can include text entries, links, and embedded videos, will be ranked by quality and community ratings. For instance, on a site about a specific beach town, a user could add a relevant YouTube video showing local attractions. Once users opt in to the feature, they’ll be able to view annotations contributed by other users within a browser sidebar, and can choose to hide the sidebar at any time. Google Sidewiki also won’t change the appearance of any webpage – all Sidewiki entries will be displayed only in the sidebar. 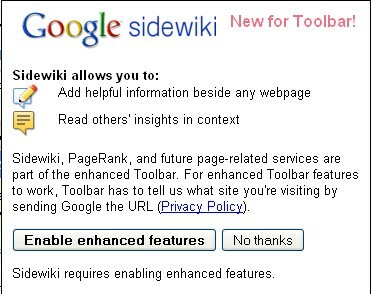 The feature requires users have the latest version of Google Toolbar installed. Don’t poo-poo this. Google has a growing penetration, and deals with major manufacturers to install the toolbar by default. Users will be able to leave comments about your site which appear as a little side-bar next to your actual site. The comments can be voted up or down (like Digg) by other commenters and (also like Digg) be subject to a “threshold” factor. They can apply to the whole page or part of a page, and they can be shared to other users – even if they do not have the searchwiki installed. On these entries, according to Search Engine Land, you’ll also find a “Useful Y/N” type button set that lets you decide if a web page is useful, in your opinion, to other users. The site owner can add a comment that is “sticky” and will stay in the top of the comments list, but if history serves, most small to medium businesses will never bother. SearchWiki comments are not going to always be nice. Again, the SEM tide is turning towards consumer created content substantially influencing the interaction between companies/brands and the web. But this effort is far more “in-your-face” and has the potential to make some headway. Postscript: I like Jeremiah Owyang’s write up on it, especially the “don’t wait, embrace now” directive. Postscript: Jeff Jarvis is spooked by the whole deal. Postscript: Steve Woodroof, John Mack, Wendy Blackburn and Dr. Andrew Spong look at the issue from the Pharma perspective. picket line photo: AmandaLeighPanda on flickr. We welcome constructive comments, but why should my local plumber be slammed because – say – he doesn’t accept online payments. Businesses should be able to opt out of this. Well, to be fair, users can currently slam the local plumber anyway via ratings on local search engines. Here, that includes Google Maps, Yahoo Local, Bing Local, Superpages, Angie’s List, etc. etc. Also, the website owner can post a comment that is “sticky” and which stays at the top of all other comments. But if my experience is any indication – websites like those owned by plumbers rarely get attention and they will not know about this feature. ouch! I can see this being a litigation battleground in the months and years ahead, and also a place for compeitiors to drop “confidence bombs” ? John, I just hope that those dropping those bombs consider the Streisand Effect before doing so.